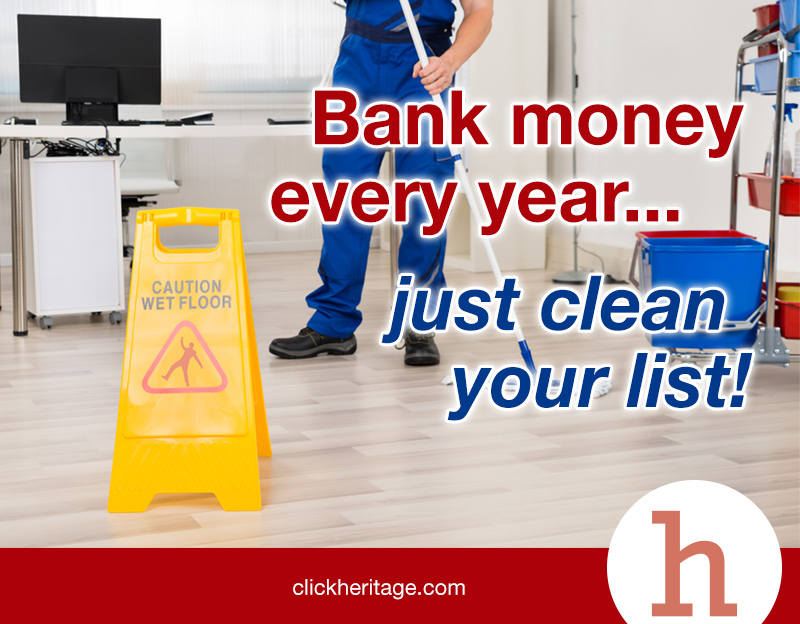 It’s easy to bank some money every year… clean your customer list! Customer lists tend to age quickly. An average of 20% of business people change jobs each year, and 1 out of 6 families move in any given year. If you don’t update your customer lists on a regular basis, you are wasting postage and printing costs each time you launch a new direct mail campaign. It is estimated that 1 out of 100 pieces of mail are undeliverable. That means if you send out 30,000 direct mail pieces, 300 will definitely end up in the garbage. The bottom line is that bad records in your customer list is wasting your marketing resources. Making a yearly commitment to clean that aging customer list can save you a significant amount of money and eliminate a lot of dead weight from your mailings. So get that list clean and have a company luncheon with the money you save each year! Step 1: Run your existing mailing list through the U.S. Postal Service’s National Change of Address (NCOA) database, which updates it with recently-changed mailing addresses. This process isn’t 100% accurate; however, newer business facilities and housing developments take some time to be added to the NCOA database. That means manual cleansing is still a must for every customer list. After you use NCOA for address verification, be sure to ask for your updated customer addresses back, so you can update your customer list to remove the undeliverable records. Otherwise, you’ll be compounding the problem with each new mailing you send out. Step 2: Salespeople and other workers who are familiar with the list should print out the list and look for missing data, misspelled names and titles, and any other abnormalities. In particular, watch for any missing addresses, zip codes and street names. This manual process takes time, which is why so many companies tend to neglect it. Step 3: As you manually review the list, look for opportunities to group records with similar characteristics together. Tag their records so that you can easily group them into sub-lists; for example, all procurement people should form one list, all engineers should be grouped into a second one and all C-level executives (CEO, CMO, CTO) should be placed into a third. In an upcoming blog post, we’ll explain how to put these segmented lists to work, creating customized, highly-relevant messages and offers that speak to each group’s deepest needs. This targeted approach can help you generate more revenue from your customer list. Although it’s not easy, annually “cleansing” your organization’s customer list can help you target it with greater precision around specific groups of prospects and their deep needs. That, in turn, can help you increase revenue and customer satisfaction.